Time flies when you’re having fun! We have already arrived at Lesson Number Five of Learn Hebrew Pod! Have you ever noticed how time also flies when you are studying for a test? No, no . . . don’t worry--you don’t have to study for a Hebrew test! But it seems that Eran has a major exam coming up, so he might not have time to go to the movies with Liat this week. 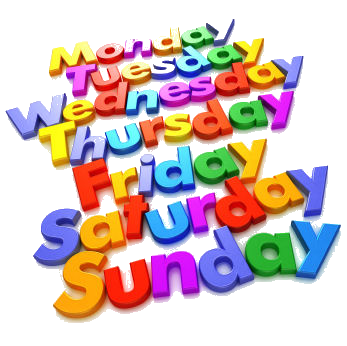 While Eran tries to find time to take a break, we will learn the days of the week. We’ll also find out that, in order to say the days of the week in Hebrew, we actually count them--first day, second day, etc. Cool . . . so we’ll also begin to learn how to count using the ordinal numbers. Did you know that in Israel, the first day of the week is actually Sunday (like it appears on most calendars)? So while the rest of the world is still relaxing and enjoying the weekend, Israelis are already up and back to work. But the bonus comes on yom shishi, when everyone is out at the ba-tey kafe in the morning and everything slows down in the afternoon in preparation for shabat. Lesson 5B also gives us our initial introduction to the use of prepositions in Hebrew, a topic we will continue to explore more thoroughly in our future lessons. So, take some time out to learn Hebrew with Jonathan, Eran, and Liat on yom rishon, yom sheni, yom . . . Oh, and will Eran and Liat make it to the movies? Tune in to Lesson 5 and find out! !